The R2 is a personal transportation device, in the category of a “rover”. Imagine a Segway without the bulk. With a sleek, streamlined design, and two separate motors, the R2 is guaranteed to be an experience unlike any other. Incredibly easy to ride, the R2 can be relaxing, or thrilling, depending on your riding style. 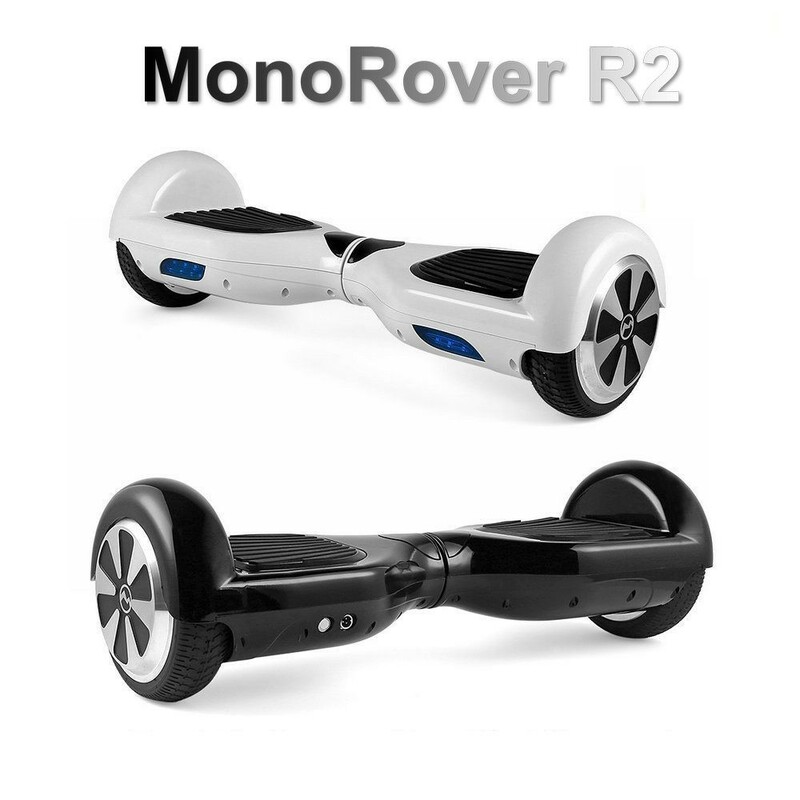 The R2 features gyroscopic technology, the same as found in Segway. Two sensors (one under each foot pad) detect the micro-movements in your feet and ankles, and relay that information to the motors. Just point your toes down to go forward, and put your weight into your heels to go backwards. The sensors are incredibly active, and within minutes of roving, it begins to feel “intuitive”. Where can I rove with the R2? The R2 thrives on smooth surfaces. Concrete, carpet, asphalt, the R2 makes easy roving out of all of them. It’s not recommended that you ride the R2 on grass, but dry dirt should be okay. * Incredibly Active Sensors – It’s almost like it reads your mind! * 2 Blue LEDs… Illuminate your world… Ridable with the LEDs in the front or the back – it makes no difference! We have just received this product and I have been BLOWN away. Especially more before the product arrived. The help desk has been great, HUGE thanks to Eileen as well and the r2 has been working well without any deficiencies. Had a customs clearance issue but the customer service contacted me and kept me updated throughout the whole process. Delay was only an extra week even though they were held by customs. Thanks to Eileen for the consistent updates! The product is great! I definitely recommend.. He has not gotten off it since the day we received it. The quality of the battery is great, lasts long. The R2 is the best purchase I have ever made! I don't know what I would do without it! I unknowingly bought one of these scooters from an unauthorized seller on Amazon and it broke a few days after I bought it. Thankfully, I got my money back and was able to buy one from this website and it works perfectly! All of my friends beg me to try riding it, and it will definitely come in handy for the long walk from building to building at school. It is so much fun! Everybody should get one! Was a little skeptical about buying one of these as I have heard about all the nightmares happening with people ordering from overseas. If they ever got their product, or who to contact if they had any issues. However after riding my friends, I just HAD to get me one, and I called MonoRover before purchasing to verify somebody would be here for me if anything happened. they kindly told me where to buy from certified Authorized Dealers. My package took around 10 days to arrive, and a kind gentlemen provided me with a tracking number after 4 days. I ride my MonoRover R2 over 8 miles everyday. It is very nice that the battery will start beeping when you have about 1.5 miles left on a charge. This way you can easily start to make your way home if need be. Thanks for the pleasurable experience MonoRover! These things have truly changed my everyday life. As A 16 year old kid, this Rover has made me one of the most popular kids in school. It fits perfectly in my locker and last the 3 mile ride to and from my home without having to recharge. My friends love it, and all have it on their wish list.